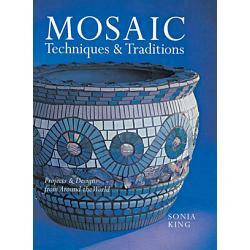 MOSAIC TECHNIQUES & TRADITIONS: Projects & Designs from Around the World by SONIA KING. 256 pages. Paperback. 8 1/2 x 11. All in Color. 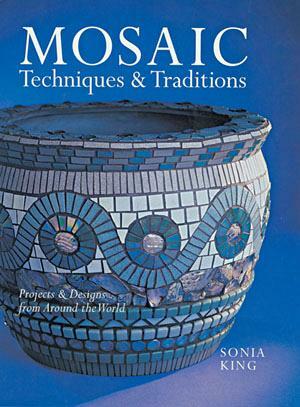 With the breathtaking work of hundreds of artists on display throughout, this visually arresting volume showcases mosaics from all corners of the globe and teaches the skills needed to produce 15 beautiful pieces of your own. The history of the art, tools and materials, and techniques come first: bases, adhesives, and grout; shaping and placing tesserae; practical and artistic design considerations; and several methods of creating the actual mosaic. Put that information to use on an array of magnificent international projects, all beautifully illustrated and with the level of difficulty noted. Five mosaics from Europe include a lovely and easy Blue Willow Tray and French birdhouse. An American-inspired Flutterby Garden Stake made of mirror simply sparkles. Plus: Sun Disks, a Rock Garden Fountain, Island Wave Vase and more. One of the definitive reference books on the market. A must have at the top of the list.